So my three years are over and all the hard work resulted in a 2:1 in Sociology and History and a place on my postgraduate course commencing in September. Three years have gone by amazingly fast, I can remember moving into halls with a feeling of trepidation like it was yesterday. The lectures, late nights and celebrations with mates have shaped my uni experience and definitely improved me as a person. 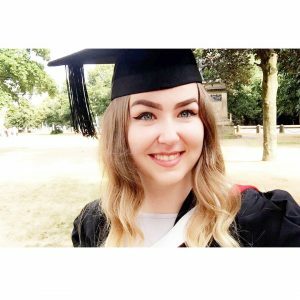 Sounds strange but before University I wasn’t sure who I was, and these three years in Cardiff have helped me find out who I really am. I’ve had so many brilliant experiences here and I’ve met countless people who have enriched my life, university has helped me step into things I never thought I’d be able to do, I’ve been pushed out of my comfort zone and loved it! Normally I hate being the centre of attention, I never even used to enjoy my birthdays but graduation was a day where I relished every second and felt proud of myself wearing my cap and gown after so much hard work to get there. I kept thinking to myself I can’t believe I’ve done it. 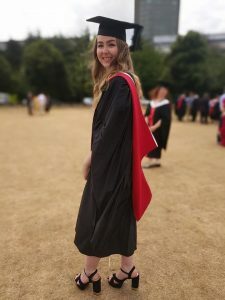 Thousands of students graduate every year but each person has faced different hurdles to get there and it becomes such an individual experience that you can’t help but be proud of yourself and everyone around you during that graduation ceremony. 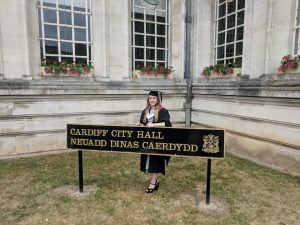 Through the wellbeing service, the tab Cardiff, Jobshop and a joint honours degree I’ve become so much more comfortable with meeting new people and my confidence has doubled. Graduation was such a brilliant day, walking across the stage with the same trepidation of moving in in first year and overcoming it all against the odds.